Overbite surgery is only one way of treating an overbite, and it is generally only used to correct an overbite that is caused by a jaw that is too short or too long. Thankfully, there are less dramatic ways to treat an overbite. The most common – and easiest alternative to overbite surgery is braces. Braces are used to correct a number of issues involving the teeth, including overbite, under-bite, cross-bite, misalignment of teeth and teeth that are too crowded. Since overbite surgery is usually a major expense and inconvenience, braces are a much more reasonable treatment, especially if the overbite is purely a cosmetic concern. Malocclusion is the term used by dentists to describe all of the different spacing and alignment issues that can affect teeth. In most cases, dental problems in this category do not cause medical problems. Usually, the reason behind correcting malocclusion is related more to appearance than overall physical health issues. There are some cases, however, where severe tooth misalignment can make normal mouth movement difficult. It is not uncommon for people with drastic overbites or under-bites to report suffering from pain in the lower and upper jaw. When physical difficulties occur because of tooth or jaw misalignment, surgery may be the fastest and easiest treatment. Braces can take several months, or even years to rearrange the teeth into proper alignment. If pain and discomfort are extreme, a year or more may simply be too long to wait. In almost all cases, however, braces are the most effective answer, so the long process of repositioning the teeth begins. 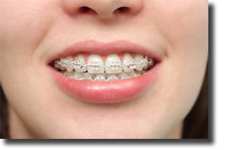 The application of braces stars with ceramic, metal or plastic bands being attached to the outside surface of the teeth. Metal bands are also secured around some of the back teeth. Once the bands are in place, springs and wires are run through the bands to connect them and force the teeth to move back into the correct position. The process of attaching the braces to the teeth can take a few visits to the orthodontist, but it is not usually painful. In some cases, the doctor may have to remove one or more of the teeth to make room for the repositioning. This is usually only required when the cause of the misalignment is overcrowding of the teeth. Any tooth extractions or other general dental work that may be needed will generally be done before any bands or wires are placed on the teeth. New and improved ways of straightening and realigning the teeth are always being introduced, and the old-fashioned “Ugly Betty” style braces are become more and more rare. Clear plastic braces and retainers are being used with increased frequency, and this makes the prospect of getting braces much easier for young people to deal with. Dentists and orthodontists generally recommend getting braces at a relatively young age – say around 12 or 13 years old. This is because the jaw bones are still soft and easily moved when a child is younger. Of course, the braces should not be applied too early either. If the bones are still very soft and pliable when the braces are removed, there is a risk that the teeth will become misaligned once again. Every case is different, and the orthodontist can make the best recommendation regarding when to start. While the braces are on the teeth, it is very important to take proper care of the teeth. This includes brushing and flossing after every meal and paying close attention to oral hygiene to avoid the appearance of marks on the teeth once the braces are removed.